Request received from the Directorate of Vulcanology and Geological Hazard Mitigation (Bandung, Indonesia) and the Natural Disaster Management and Refugee Coordination Board task force (BAKORNAS PBP, Kupang, Indonesia), on September 07, 2003. Emergency mode engaged under mandate of the Canadian Space Agency on September 11, 2003. RADARSAT-1 descending pass (August 20, 2002) and ascending pass (May 1st, 1999) archive images (standart beam S7); delivered in September 2003 by the Canadian Space Agency. RADARSAT-1 descending pass image (standart beam S4) acquired on September 18, 2003; delivered on September 21, 2003, by the Canadian Space Agency. RADARSAT-1 ascending pass image (standart beam S3) acquired on October 09, 2003; delivered on October 17, 2003, by the Canadian Space Agency. End of the delivery of results: October 22, 2003. Termination of the project: October 31, 2003. 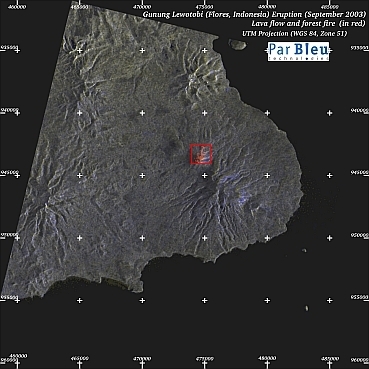 On September 1, 2003 at 7.30 pm Mount Lewotobi Laki-laki on Flores Island, Eastern Indonesia erupted. It was spewing ash, lava, rocks and other volcanic material in the form of fireballs. Minor and major eruptions were recorded during all the month of September 2003. 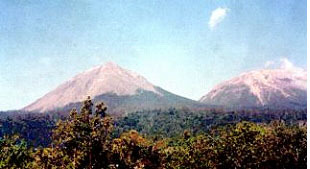 Hundreds of hectares of crops on the mountainside such as rice, corn, coconuts and coffee were destroyed and forest fires have been sparked out of control around the volcano. Thousand of refugees were evacuated from around the mountain as they began to suffer from acute respiratory tract infection (ARI) and cholera as they were breathing white volcanic ash mixed with sulfur. The villagers were forced to drink water contaminated by lava and sulfur and the vegetables could not be eaten, while the animals in the area have also suffered because of the contaminated vegetation. The places Boru, Boru Kedang, Nawa Kote, Nuri, Nobo Kanga and Hokeng Jaya are all located on the slopes of the volcano, home to more than 10,000 people. The most affected village was Hokeng Jaya with a population of around 2,300 people. The village was covered with volcanic ash measuring three-to five centimeter deep. The area of interest (i.e. 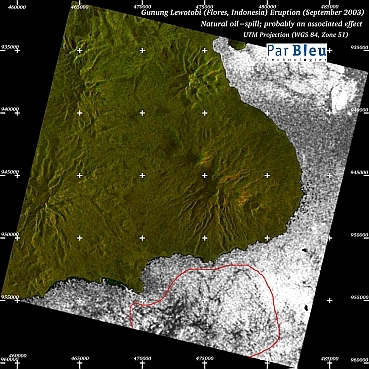 the area affected by the eruption) that has been surveyed extends over 30 x 30 kilometers. 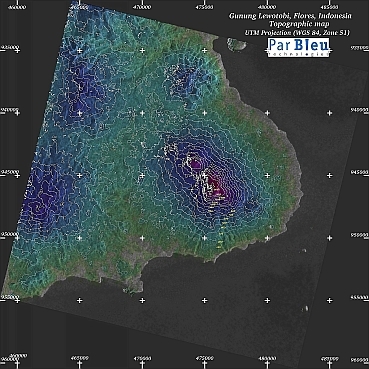 All the detailed maps (processing by ParBleu Technologies Inc.) are produced in cartographic projection UTM WGS 1984 (Zone 51 L), and at a spatial resolution of 20 meters x 20 meters. On all maps, crosses are spaced every 5 kilometers, at UTM coordinates that are a multiple of 5000. The damages to crop cultivations were not detectable with the Radarsat-1 radar images, unfortunately.